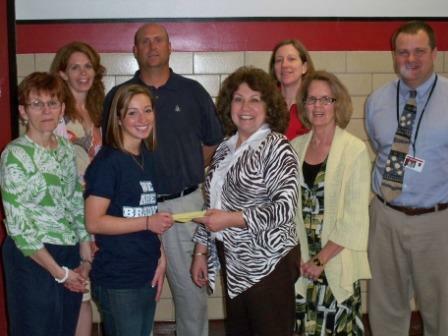 CLEARFIELD – The staff members of Clearfield Area Middle School who chose to participate in Casual Fridays donated $1,700 this school year. Pictured are teachers who will be walking to support Brady’s Smile making a donation to Clearfield High School junior Becca Ward. Ward has organized The Bison 5K walk and run to benefit Brady’s Smile on June 4. Information is available at www.bradyssmile.org and www.clearfield.org. Middle School Casual Day donations went to various local charities in need of financial support including: Salvation Army, Shoe Bank, Food Bank, Orphans of the Storm, Spay and Neuter Clinic, Books for Children, Rural Free Clinic, Presbyterian Church Dinner, and Brady’s Smile.